Education Department. Available subjects for PGT Teachers recruitment are Chemistry, Physics, History, English, Hindi, Mathematics, Sanskrit, Geography, Biology, Economy, Commerce. Eligible Applicants with Post Graduate degree with B.Ed qualification have to send the application for the post PGT using the official website www.jssc.in. Jharkhand SSC PGT Teachers recruitment selection is based on PGTTCE Exam- 2017 Pay Scale for selected candidates is Rs. 9,300/- to Rs. 34,800/- with GP of Rs. 4800/-. Full details of essential qualifications, Age limits, Selection Process, Application Procedure, Examination fee details of Jharkhand JSSC Recruitment of 3080 Post Graduate Trained Teacher Jobs Recruitment are given below. 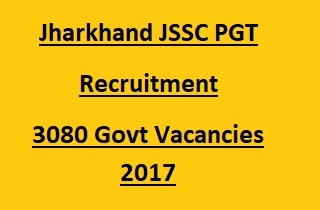 Total Vacancies available in Jharkhand JSSC PGT Recruitment through Post Graduate Trained Teacher Competitive Exam PGTTCE- 2017 are 3080 posts. Post Name: Post Graduate Trained Teacher PGT: 3080 posts. 1. PGT- Hindi: 140 posts. 2. PGT- English: 140 posts. 3. PGT- Sanskrit: 140 posts. 4. PGT- Mathematics: 140 posts. 5. PGT- Biology: 140 posts. 6. PGT- Physics: 140 posts. 7. PGT- Chemistry: 140 posts. 8. PGT- Geography: 140 posts. 9. PGT- Economics: 140 posts. 10. PGT- History: 140 posts. Candidate must have completed Post Graduate Degree in relevant subject with B.Ed qualification. Please check the notification for more details. Minimum age limit is 21 years and maximum age limit is 40 years. Jharkhand SSC Recruitment selection is based on written examination. See the notification for JSSC PGTTCE Exam Syllabus and Pattern details. Application forms for the post PGT available at www.jssc.in. Click on the link and select the desired post. Fill the application and submit from 01-12-2017 to 10-01-2017.